Tennessee Titans defensive tackle Mike Martin (93) and defensive end Karl Klug (97) tackle Houston Texans running back Jonathan Grimes (41) during the second half at LP Field. Tennessee won 16-10. The season finally, mercifully, is over for the Houston Texans. Now they’re ready to find out who their next coach will be along with their future teammate with the No. 1 draft pick overall — something that can wait until May. Jonathan Grimes scored the first touchdown of his NFL career, and Matt Schaub had three of Houston’s four turnovers Sunday as the Texans wrapped up their season with a 14th consecutive loss, 16-10 to the Tennessee Titans. Texans owner Bob McNair already has been busy interviewing coaches looking for someone to replace Gary Kubiak, whom he fired Dec. 6. Interim coach Wade Phillips would like to be that man, and several of his defensive players said they would like to see him promoted. "But it’s up to whoever makes that decision," Houston linebacker Whitney Mercilus said. "We’ll see what happens from there." Defensive end J.J. Watt said he’s not the man to ask about whether Phillips is a good fit as head coach. "I’m a football player and not a football coach or a GM," Watt said. "Wade is a good football coach, and he brought me to this town and so I will always be appreciative of that. I have no clue what they are going to do, so that is a decision for people that are paid a lot more money than me." Former Chicago coach Lovie Smith reportedly has interviewed for the job along with Penn State coach Bill O’Brien and Phillips. With reports that O’Brien is a leading candidate, speculation centers around whether Phillips would agree to remain as defensive coordinator if he is passed over. Phillips had the Texans ranked seventh in the NFL in yards allowed going into Sunday’s finale. Phillips said he just couldn’t answer that question after finishing what might have been his most difficult season as a coach. His father, Bum, died in October. "I had some personal things to go through myself," Phillips said. "It was a tough year that way and then the way our season went. I still believe the guys played hard. I didn’t ask them to wine very game. I asked them to play hard, and I thought they did that." The Texans (2-14) finish the season not having won since Week 2 when they downed Tennessee in overtime and with 15 players on injured reserve. Grimes became the fifth different running back to start this season. He capped the opening drive to give the Texans a lead they held until the third quarter, but Grimes also lost a fumble. 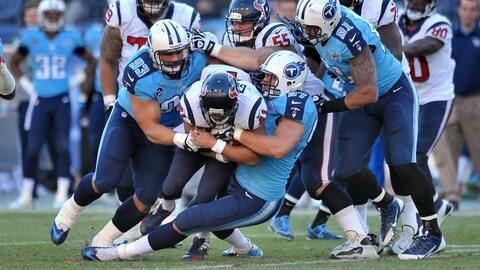 The Titans (7-9) scored 16 straight points and converted the four turnovers into 10 points. Chris Johnson ran for a TD and 127 yards in becoming only the sixth man in NFL history to start his career with six straight 1,000-yard seasons in what might be his last game in a Titans uniform with $29 million and three years’ left on his contract. Schaub got his second straight start in what might have been his final game in Houston after losing his job to Case Keenum and with the Texans now getting the pick of the 2014 quarterback class. He was intercepted twice, giving him 14 for the season, with one ball bouncing off a defender’s face mask to Titans linebacker Akeem Ayers and the second ending the Texans’ last hope of ending this skid this year. "Matt’s going to play somewhere," Phillips said. "If not here, I think he’ll play somewhere." Pro Bowl receiver Andre Johnson said he couldn’t come up with words to really describe what the Texans went through this season except nobody wants to experience that again. Now he’s waiting to see what changes take place once on a franchise where he wants to finish his career. "We will just see what happens with the whole process," Johnson said. NOTES: Johnson finished with six catches for 49 yards for Houston. … The Titans snapped a three-game skid to Houston in this series. The Texans had won three of the past four in Nashville.